City planners and designers can help make spaces safer in many ways. One strategy is known as Crime Prevention Through Environmental Design (CPTED, pronounced “sep-ted”). This approach is based on the idea that specific built and social environmental features can deter criminal behaviour. Strategies can be as simple as good maintenance, like rapidly removing graffiti, which can deter some offenders. Another method is to build houses, streets, transport hubs and retail settings in a way that promotes visibility. This can include making windows and entrances of buildings face each other and clever use of lighting. The enhanced visibility this creates is known as “passive surveillance”, which can deter some offenders. But in some cases design to prevent crime goes too far and creates hostile spaces. Examples of such unfriendly architecture include the use of metal studs or bolts to break up smooth surfaces to discourage skateboarders. 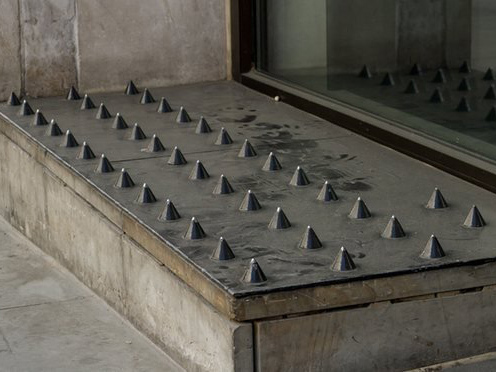 In some countries, spikes have been installed in places where people tend to sleep rough. An extreme example of this is the idea of coin-operated benches with retractable spikes. Too much security can lead to sterile places no one wants to use. It can also result in locations that exclude certain groups of people, such as the young or the homeless. And some of these principles, if misapplied, can increase crime and fear of crime, reducing quality of life. In 1973, architect Oscar Newman led a ground-breaking study comparing two New York social housing projects. Van Dyke (a high-rise building) had crime rates more than double those of Brownsville (a low-rise building). Given the similarity in populations, Newman argued the physical design of the buildings could explain this difference in crime. This was the beginning of crime prevention through environmental design – a set of design principles now used, and sometimes mandated, in cities around the world, including Australia. These principles were used in the Perth City Link project, reconnecting the central business district with the entertainment district by sinking the railway line. Public spaces were designed to be overlooked by users of surrounding buildings and spaces. Locations and activities in the area were connected by wide and highly visible pathways, CCTV was installed and lighting levels optimised to promote the use of pathways and spaces after dark. Use of crime prevention principles is wide and varied. Examples range from installing signage to show ownership and deter outsiders, to installing better locks, doors and windows. Another strategy is to use permeable fences that provide barriers to access without compromising visibility between buildings and the street. Studies show these principles, when applied appropriately, can be successful. In the Netherlands, the risk of residential burglary fell by 95 percent in new estates and 80 percent in existing homes after these ideas were implemented as a wider wave of crime prevention in the late 1980s. Similarly, in the UK several studies have shown significant reductions in crime through using principles such as building houses to face each other and the use of permeable fencing and managing foliage to maximise visibility. Retail crime has also been reduced by, for instance, configuring and reducing the height of aisles so staff can see them more easily. Like all good ideas, designing to prevent crime can, in some cases, cause harm. Failure to assess crime risks before implementing solutions can result in poor outcomes that don’t deal with the local issues, which can make these worse and waste resources. This has been labelled as the “dark side” of design. Building a large wall around a religious building based on a perceived crime risk, for instance, might not be the best response. This is particularly the case if, when the crime risks are analysed, the building has only suffered incidents of minor graffiti. The expensive wall then needlessly divides the community and provides a blank canvas for more graffiti. Then there’s what is called hostile or defensive architecture. This is often used to discourage certain groups, which are often not actual criminals, from using specific spaces. barriers placed around hot air vents to exclude or discourage rough sleeping or excessive lingering. Coin-operated retractable spikes on benches, as shown in this art installation, could be the next step in hostile architecture. How can we use the principles better? There are certainly benefits to using design elements to make people feel safer. But these design principles are not outcomes. Reducing crime should be a process where a risk assessment of crime comes first, and the solution of dealing with it comes in response to this. In NSW, it’s mandatory to include a report assessing new large developments against principles of crime prevention through environment design. Crime risk assessment is part of this process, which should be a positive outcome. But such assessments are generally inconsistent, incomplete, too generic and of poor quality. One reason is because it’s difficult to obtain up-to-date crime data at the scale required to assess a small location. Collecting and analysing better-quality crime data can help reduce negative outcomes of such designs. Practitioners need to carefully consider the potential harm and negative impacts on the quality of life, not to mention the ethical implications, of any intervention before implementation. It’s also important to consider alternative strategies that could be more effective than deterrents.